Recognition of Royal authority and the Queen as Head of State and Head of the police. Symbol of achievement, victory and valour. Originating in Ancient Greece where the laurel wreath indicated the best and most worthy. Symbolises members of the police ready to go in any direction in order to perform their duties. Incorporating the kangaroo paw, black swan and kangaroos, being the symbols which typify Western Australia. The Western Australia Police Force logo is one of the most recognisable symbols and represents the values and conducts that Western Australian community members have come to trust and depend upon. To ensure community confidence in the WA Police Force remains strong, it is imperative the logo and affiliated branding is managed appropriately and not misused. The WA Police Force logo may not be used without the written approval of the WA Police Force. All requests to use the WA Police Force logo are to be emailed to Corporate Communications Branch SMAIL. The new Western Australia Police Force Flag was first flown during Police Week, September 2005. It is a contemporary design that replaces the previous WA Police Force flag which was in use for approximately 35 years. 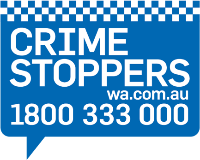 It displays an etched version of the WA Police Force logo in white, surmounted over a swan in defensive posture, in police blue, upon a white field. The fly of the flag shows the Sillitoe Tartan as a graduated vertical band. The Black Swan is a fauna emblem of the State of Western Australia and has consistently been an image on Police regalia and motifs since 1870. The swan’s outstretched wings represent freedom from fear and its posture a symbol of all police officers’ obligation to protect Western Australians. The Sillitoe Tartan is a recognised international symbol of policing. The flag is based on a winning entry submitted by Carine Senior High School Year 12 student, Anne Cobai, to a 2005 competition in which secondary school students submitted flag designs. The Western Australian Police banner is used as a ceremonial emblem of the WA Police Force. The WA Police Force banner is paraded during graduation ceremonies, police memorial ceremonies, mess dinners, parades and at other high profile police ceremonies. The banner is royal blue with the police insignia displayed on both sides and gold thread around the three edges. The banner is made from pure silk. The WA Police Force banner is stored and displayed at the WA Police Academy in Joondalup within a secure glass cabinet. The custom of presenting banners in Australia started in 1904 when twenty banners were presented to Australian Army Units for service in the Boer War. The banners were presented by King Edward VII to eighteen light horse regiments, the Royal Australian Artillery and the Australian Army Medical Corps. A further twenty three of these banners were presented to infantry units in 1911. Upon Government approval, the WA Police Force adopted the custom of having a banner as recognition of the service given to the Western Australian community. The first WA Police Force banner dedication ceremony was held at the WA Police Academy on 19 September 1989 in Maylands. This banner was decommissioned on 18 February 2005 after 16 years use at the Police Academy and is now on display in a custom glass case. A new banner has been in use since that time.